Is it possible the mysterious rubber on ashtrays was added to stop rattles or squeaks? The ashtray covers sort of 'hover' in the air; they do not make contact with the surround. So they should not squeak. But they might squeak at the hinge in some way I guess. I guess the only way to see would be to drive the car with the foam removed. If they do squeak it will drive me mad! Nice project although it looks like your going to have to spend a few pennies on the rear, i'm guessing with the bodyside mouldings it will be easy to spray the lower half of the car, then both rear quarters and the rear bumper ? Nice project though, i keep looking at the older Jags for something to smoke about in, the Daimlers are quite rare though. Oh this thread is heaven!!! What a beast of a car - brand new it must have been incredible. I can't wait to see what you do with the bodywork - anything has to be better than the rattle can job. I can't imagine the mind of the person who sat with that beautiful wounded Daimler in front of them and thought they could make it better with a rattle can. The interior is gorgeous, I can only imagine how soft that leather is. It's held up pretty well considering. Subscribed in an instant. Whenever you can find the time to work on the car and then write about it for us whilst juggling a young family. I will be right here ready to read it! On the Friday just gone, Lindsey said "I'm at mothers, pop in for a cuppa if you like". So instead I popped home, swapped the X358 for the Daimler, and had a fun drive over to Lindsey's mothers house. While there, Lindsey's younger brother had a look at the Daimler. He used to do car body repairs, and has sprayed a few cars, including his last. He was in a nasty car accident in his early 20's and is partially disabled. He has slight brain damage; although it mainly affects his short term memory. But he loves cars and still works on them all the time; you can't keep a car enthusiast from their passion!! Anyway I had intended to take the Daimler to a wall known bodyshop, but now Lindsey's brother is determined he wants to repair it for me.... it will probably take him longer, but I'm in no hurry. In some ways it will be quite nice to know he'll enjoy the restoration I suppose. I'll still pay him for it, as its only fair, and he has a lovely big workshop for it to live in while he does the work. We had a nice evening at Lindsey's mums, and I get roped into fitting their new shower the next day.... then we leave after having a family takeaway. So bang goes my Saturday, now I'm fitting a shower for her mum. I assumed I'd get little time on the Daimler. So then I just hoped a might get a bit of time on Sunday... but would you believe it, a trip to the doctor reveals 13 week old Aston has two teeth coming through, and has chicken pox. So we spent most of Saturday and Sunday keeping him calm, as he seems in a lot of pain. I did get a few minutes to myself on Sunday though - when Aston was asleep! I only had a 20 minutes, so my attention turned to the interior, which will need a leather repair kit and a plan for new lambswool mats. Imagine my pleasure at reading the engine plate and finding out the trim colour is "NED" - that's magnolia, the same as my X358!!!... as luck would have it I already have a scuffmaster kit for that. 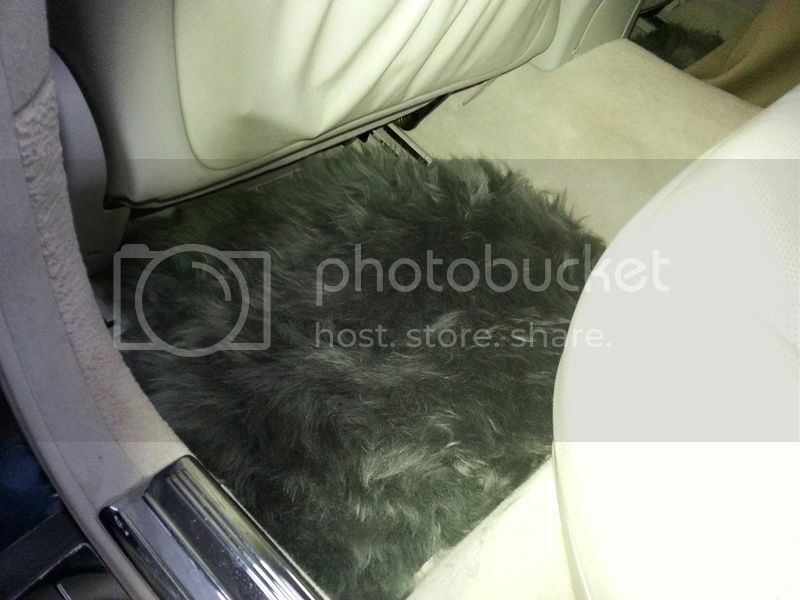 A few years back, I purchased genuine sheepskins for my last Mercedes S class, which worked pretty well. 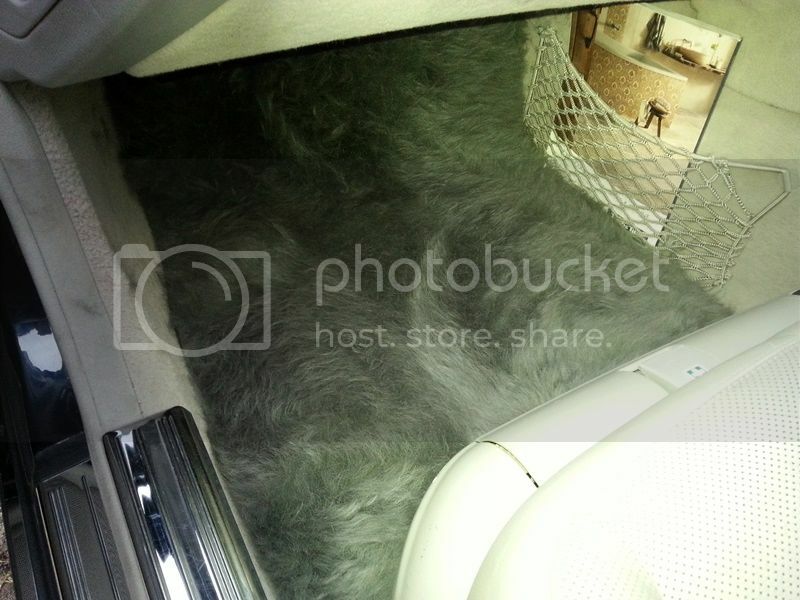 But they are not cheap at around £40 per sheepskin, it would take 4 sheepskins to do all four mats in the Daimler. The grey ones in my Merc looked OK, although I did think the pile of a bare sheepskin was a bit deep (I think it was over 1 inch deep). 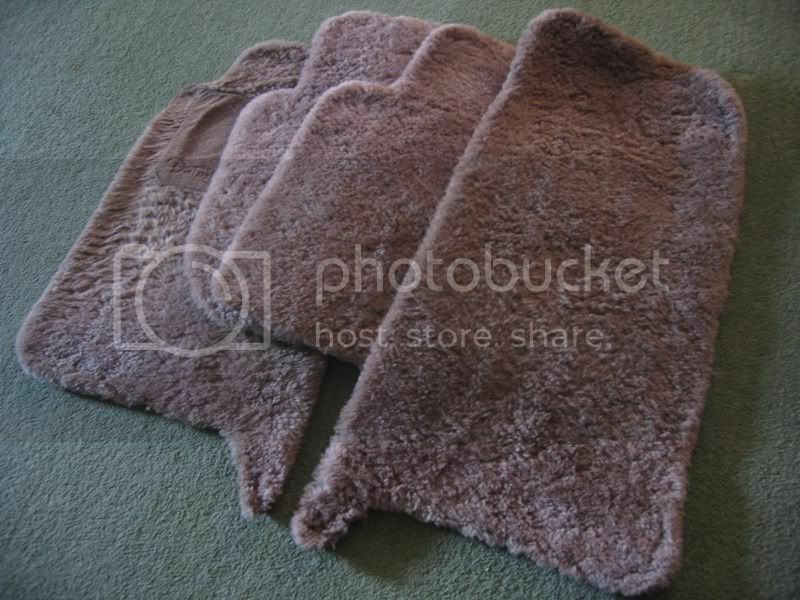 They are fake sheepskin rugs. I cannot find a good colour match for my sable carpet anywhere, so I plan on trying the brown out. Might work as a nice alternative while I source some genuine mats. I don't think that's remotely fair and if nothing else, it may make people think twice about posting because in your eyes it doesn't constitute a "proper project". That's a bad thing - I want people to post more, not less. If you, or anybody else doesn't like what people are sharing you don't have to read it. But just because something doesn't fit your criteria of what constitutes a project doesn't mean that there aren't plenty of us who find it a valuable contribution. It takes a lot of effort to put this stuff up on here and I am grateful for everybody who does it. Not sure how I've missed this thread but well done! My little one has just turned one, so I know exactly what comes along with new parenthood Congratulations! That last update wasn't rubbish at all, nice to hear about your other half nicking the Daimler and hearing about Astons teeth coming through. I've been struggling to get time on the Daimler, I took it to a body shop two weeks ago to get a quote for the bodywork it needs... but no quote back yet. In any case Lindsey's brother is still very enthusiastic about doing the work, so we'll see. Saturday morning, little Aston woke at 5am wanting food... so I fed him and he was full of life, so I had to play peekaboo and pull faces to entertain him. Then at around 8am he nodded off. So I hatched a plan, Lindsey was asleep, so I wafted off in the Daimler to get some more body shop quotes. First stop was East Bilney coachworks in Kings Lynn. I used these guys when I crashed my XJ40, they were called Bennets back then and they did a fantastic job. I also used them for the bodywork on my last Daimler, which I imported from Belgium and had scrapes and dents all over. So I read that they were now in a new place the other day, after previously assuming they had gone bust. I decided to give them a try now. I spoke to an older gentleman in reception, who recognised it as a Daimler Super straight away. He was great fun to talk to and it was a little disappointing when the estimator guy said they would not touch the car as it had rust on the wheel arch. They'd be replacing the whole panel, but he said it could still come through?!... It as therefore not worth showing him that it needed 2 new front wings too! On Sunday (today) I decided to make a start on something I could do myself - the leather. I should mention the armrest was scrubbed and cleaned to within an inch of its life a few weeks ago. I gave it a quick wipe over before starting. Bit by bit, I layered coats of Ivory dye... it was a great colour match. This was followed by a huge bottle of milk, then he went back to sleep - and work on the armrest resumed. The dye is still drying, but I am pleased with the results. It's nice to see as the drivers seat needs work, and a little on the passenger one too. Looks much better, and Aston has shown enjoyed his dinner too! That's all folks! Thanks for reading. Incredible job on the armest, bloke. I tried a DIY job on my leather steering wheel, did a terrible job of it hahaha. The car is beautiful and glad to see it is in solid hands. Keep it up.